When I was growing up, entertainment in the backseat of a car had a whole different meaning to what it does today. Presently, backseat entertainment is geared at a much younger audience. Audiovox’s in-car VOD10PS2 Mobile Video PlayStation 2 computer entertainment system would appear to have heaps of appeal to both bored backseat youngsters and drivers who appreciate peace and quiet from passengers. 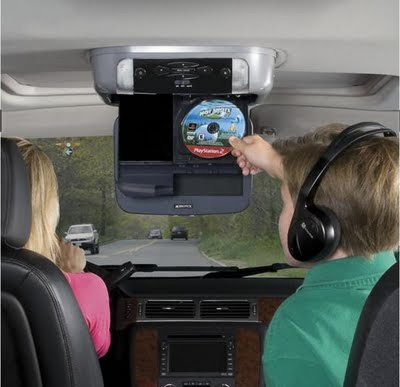 This mobile video system is an all-in-one, overhead, drop-down that combines the Audiovox's overhead unit with one of the gaming industry's best-selling systems, the PlayStation 2. Audiovox says the integration between its video unit and the PlayStation 2 is seamless. No extra hardware is needed, and there are no wires draped across the back seat passengers - the system even comes with two wireless controller and two sets of wireless headphones. 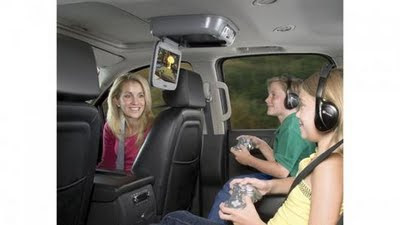 "This system allows the consumer to give their restless back seat occupants options in travel; watch a DVD or play one of their PlayStation 2 games," said Tom Malone, president of Audiovox Electronics Corp. "The PlayStation 2 system offers a huge library of more than 1,800 games for all types of interests, and now we're making it easy to play them all in a vehicle by fully integrating PlayStation 2 into the car's entertainment system with no wires and no extra hardware." The VOD10PS2 has a 10.2-inch 16:9 LCD screen with built-in dome light, two wireless game controllers, two fold-flat IR wireless headphones and two PlayStation 2 game titles (Ratchet & Clank: Going Commando and Hot Shots Golf 3). It also includes a remote control, built-in 16 channel FM Modulator with FM transmitter function, and comes in Shale and Pewter trim rings and snap on covers to blend in well with modern vehicle interiors. Audiovox believes the combination of the two popular systems is sure to be a winner with consumers. This system is being marketed under the Audiovox and Advent Brands and is available for sale in North America at all major retailers and car dealerships for USD$949.99.